A highly entertaining, scurrilous and fascinating book on Australian con men (and women) and all their dirty, devious tricks. There are con men you fear and con men you hate, and con men with amazing stories who take your breath away with their dirty tricks and sheer brazen effontery. How do they get away with it? 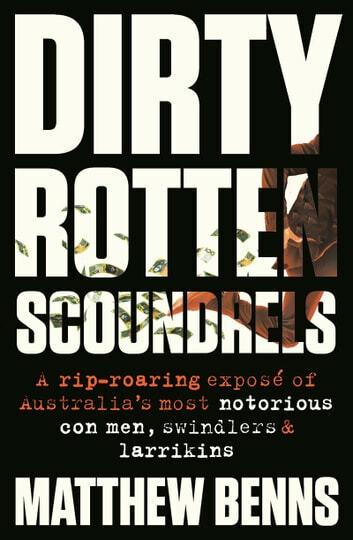 Written by bestselling author Matthew Benns, Dirty Rotten Scoundrels is a rollicking rollcall of all the worst and most outrageous scammers and dodgy dealers, a true crime book that will have readers gasping in disbelief at the sheer effrontery of these Aussie crooks and amazed at the gullibility of their victims. Con artists often revel in the image of a larrikin but this book will push beneath the veneer to delve into the true nature of the evil these people do and the long lasting damage, emotional and financial, suffered by their victims. A short little book summarises some olde and more recent cons and frauds by Australians or in Australia. Interesting in the diversity, appears well researched and well written. Benns misses some big cons, such as the con conducted by some groups where marks are continued to be hit - migration schemes, free “investment” seminars and hotels rooms, and third party insurance scams. An easy read, but I would have liked some more in-depth discussion on some of the issues. When is a marketing scheme a con. We have people paying a fortune to expensive “learn about secrets” of investment, regenerative agriculture, homeopathy, crystals, and better health. Whilst it is a good read, you also feel angry at these crimes & how weak the justice system is in dealing with them. Worth reading.